Key metaphors help determine what and how we perceive and how we think about our perceptions. The cartoon is a metaphor really for the fact that it's almost impossible in our celebrity obsessed culture to move around genres and sort of change you ideas, change your face, you know? Did you ever think about life as a metaphor for television? A whole generation of writers dined out on the dialectic between original cultures and their culture by progress. They became traveling salesmen of metaphors. Imagine a school with children that can read or write, but with teachers who cannot, and you have a metaphor of the Information Age in which we live. 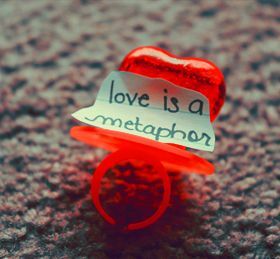 Metaphor is a simile or an allegory which makes reading or poetry more interesting. Metaphor is very rarely used in everyday life or while speaking but since they convey our thoughts and ideas more clearly in an attention-grabbing and thought provoking manner, they are quote popular. There are numerous metaphors about life given by famous thinkers and leaders. For instance, G K Chesterton said “all slang is metaphor and all metaphor is poetry.” Another quote by the great scientist Albert Einstein is also quite popular. He said, “Gravitation is not responsible for people falling in love”. Metaphors give a shot to your writing, especially for essays, poetry and will also attract the attention of the crowd while including them in speech. It is not possible for everyone to give a new metaphor. Here are various quotes on metaphors. Read them and share them with your friends.